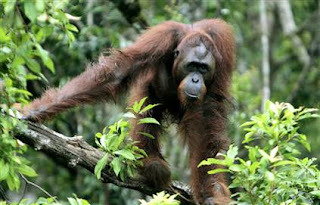 Animal Wildlife | Bornean Orangutan | The Bornean Orangutan is a species of Orangutan native to the island of Borneo. The Bornean Orangutan is one of only two species of ape that are found in Asia, the other being the slightly smaller and closely related, Sumatran Orangutan. 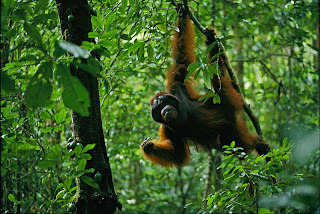 The Bornean Orangutan is found inhabiting tropical and sub-tropical rainforest in the lowlands of Borneo and can also be found grazing at elevations of up to 1500 m. The Bornean Orangutan makes full use of it's surroundings dwelling both on the ground and at different heights in the trees. There are considered to be three different sub-species of the Bornean Orangutan, which although similar in appearance, are differentiated by the areas of the island that they occupy. 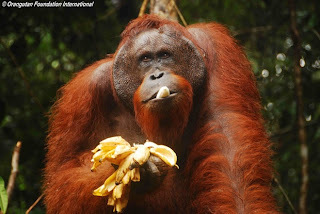 The three Bornean Orangutan sub-species are the Northwest Bornean Orangutan, the Central Bornean Orangutan and the Northeast Bornean Orangutan. The Bornean Orangutan is generally a more solitary animal that the Sumatran Orangutan with male and female Bornean Orangutans only really coming together to mate. As with the other great apes, the Bornean Orangutan has a number of features which makes living in the jungle a bit easier, including having opposable thumbs which come in handy when the Bornean Orangutan is peeling fruit. The Bornean Orangutan is an omnivorous animal, but the majority of it's diet is made of fruit which the Bornean Orangutan is known to travel vast distances through the forests to find. 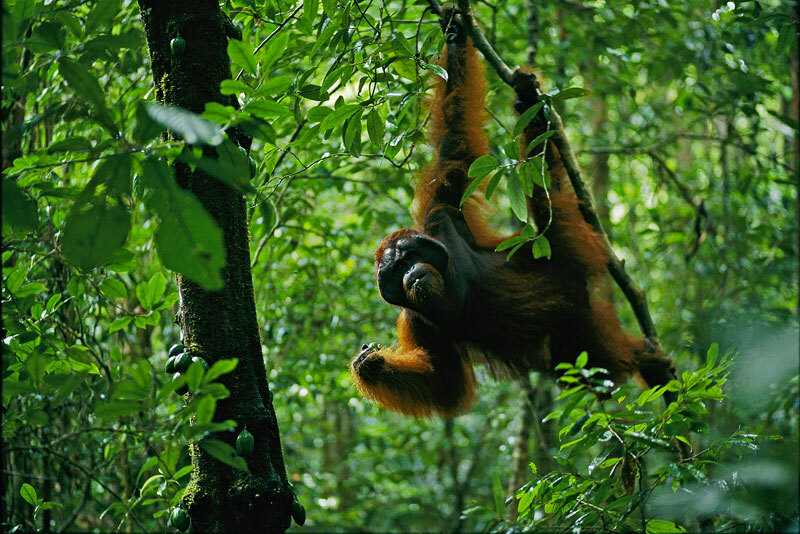 The Bornean Orangutan also eats leaves, nuts and berries, along with insects and occasionally small animals such as lizards and rodents. 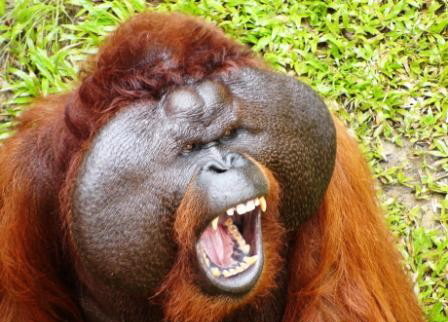 Due to it's large size, the Bornean Orangutan has no real predators on it's native island of Borneo. The biggest threat to the Bornean Orangutan is habitat loss caused by deforestation which has completely wiped out the Bornean Orangutan populations in certain areas. 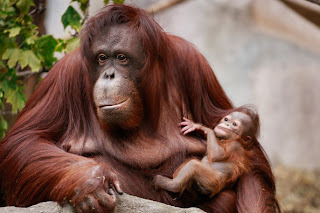 The different Bornean Orangutan sexes only really come together to mate, and once born, the Bornean Orangutan baby is looked after by it's mother. The Bornean Orangutan baby clings to it's mum for the first year of it's life and may remain with her until it is nearly 10 years old. Bornean Orangutans have a relatively long childhood when compared to that of the other great apes. Today, the Bornean Orangutan is one of the world's endangered species with less than 45,000 Bornean Orangutan individuals thought to be left in the wild. The main reason for the demise in the Bornean Orangutan populations is deforestation across the island for logging and to make way for palm oil plantations. 0 Response to "Bornean Orangutan"